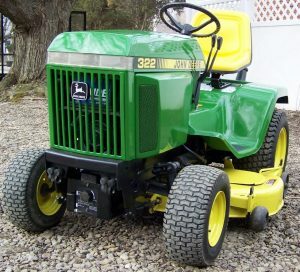 When you own a John Deere, you mow because you want to. Not because you have to. 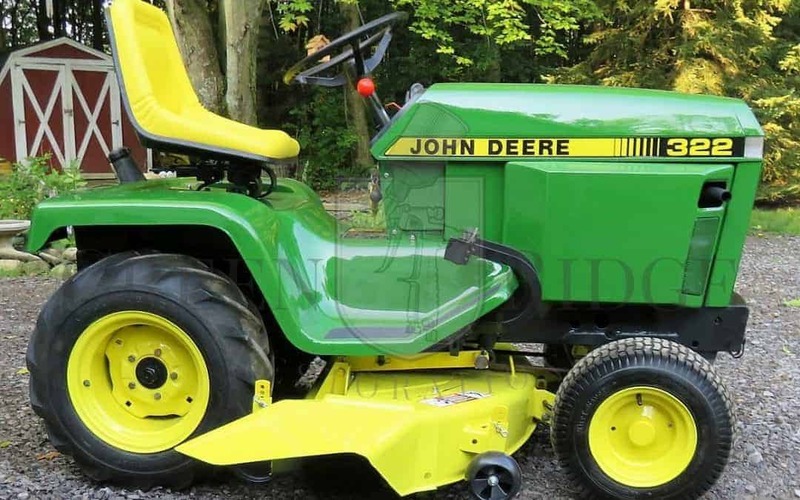 ✪Want to see our John Deere garden tractors currently available for sale? Click here. 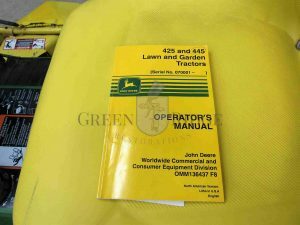 The John Deere conversation often includes a confession of sorts. …all that is fuel for the fire – the conversation fire, that is. 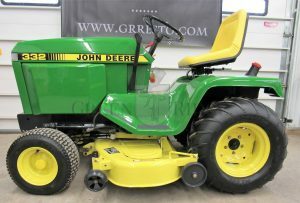 A lot of reminiscing goes on, a lot of praise for the John Deere line, a lot of “I wouldn’t own anything but a John Deere,” and then…. a confession. No, not that kind of confession, about something they’ve done that they shouldn’t have. First time I heard something like this I was bracing for a humdinger of a story. 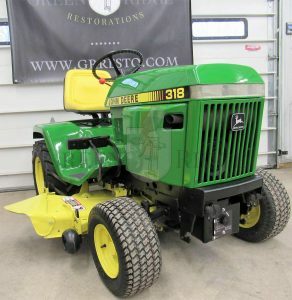 Not sure what I was expecting to hear, I nonchalantly folded my arms over, leaned back against a John Deere 318 that was waiting to be restored, and waited for the real-life confession, whatever it may be. 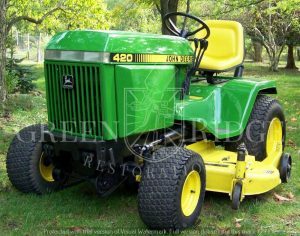 If you’re a John Deere enthusiast, I know you can relate. Then he got a big grin across his face. “Yeah, that’s right. 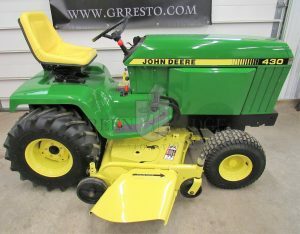 There’s some days I can’t wait to hop on my John Deere and mow the lawn. You know why? Well, he had me hooked now. I had to know why. He went on to explain how it was ‘his’ time. 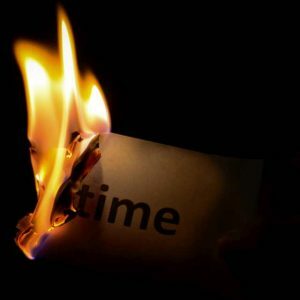 Even if it was just an hour, it was his own thoughts, ideas, plans, and projects, his own reflections of life. 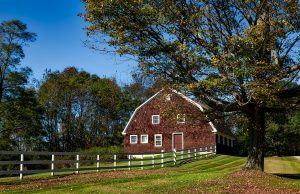 Between work and family, he explained, he just needs that ‘breather,’ like taking a step away, and recharging his inner battery. After that confession, there was a brief silence in the shop. He quickly added: “Now, don’t get me wrong. It’s not that I don’t like work or family or life. It’s nothin’ like that. It’s just that sometimes I feel like I need a break from the daily grind. 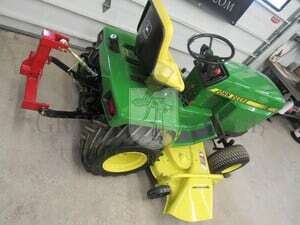 So I head to the garage, hop on my John Deere, and out I go. Doesn’t matter if that grass doesn’t need mowing. I need to mow. I was, too. Because I understood what he was saying. I get it. It’s About Taking a Step Back from Life. He loaded up his restored 318 that he purchased, we shook hands, and he drove off. In different words, many a customer has expressed the same feelings. 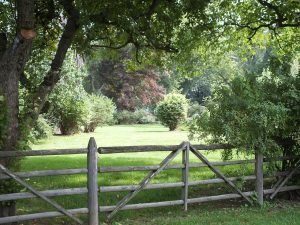 How many times have we heard the old phrase, “the world is too much with us?” William Wordsworth wrote that over 200 years ago. Heck, I bet he’d say the same words today – and probably a lot more! 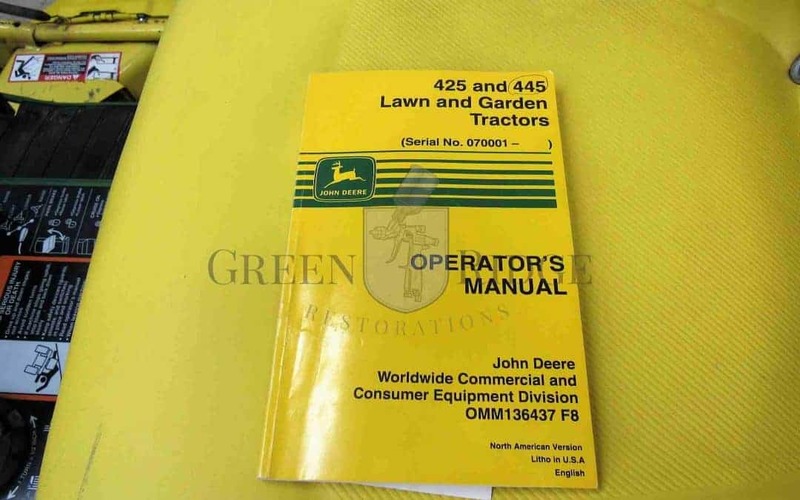 I’m guessing that when the John Deere’s were engineered decades ago, the inventor never imagined that not only would the tractor tend to the lawns, in its own way, it would tend the owners, too. 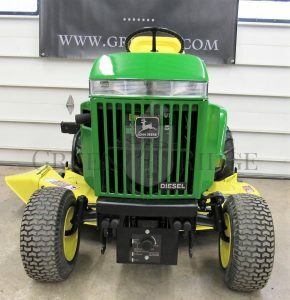 Faithful John Deere owners not only mow lawns, they mow back life, so to speak, for just a little bit. 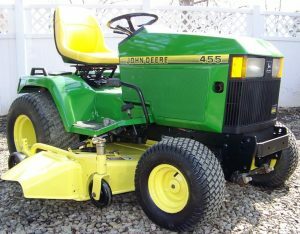 For a half hour or hour or whatever length of time, they hop on their John Deere’s and take a step back from life. If we only had a patent for that! 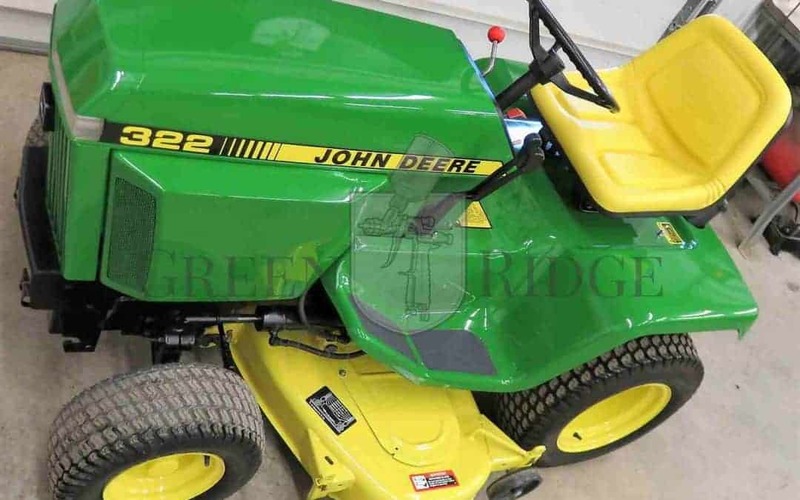 Have You Heard of the John Deere 322 Lawn Tractor? 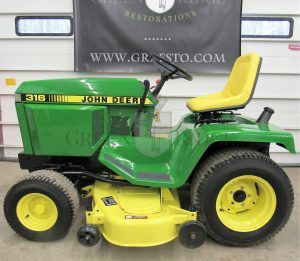 ✪If you’re looking for a John Deere 322 for sale, click here to see our latest offering. 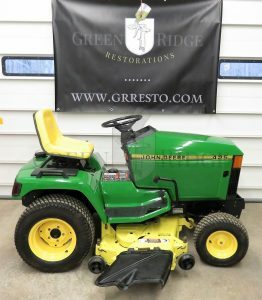 Many people – even those who aren’t John Deere enthusiasts – are familiar with the 318 lawn and garden tractor. 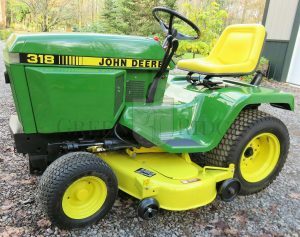 But mention the John Deere 322 – and few people even recall it. 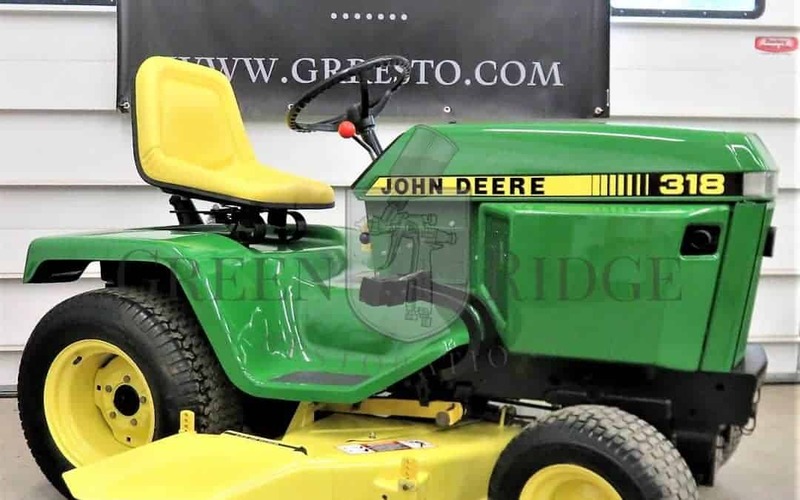 With some sources pointing to an original sticker price of $6,800 back in the day, the Deere 322 was (and remains) a shining example of John Deere’s history of producing quality lawn tractors. 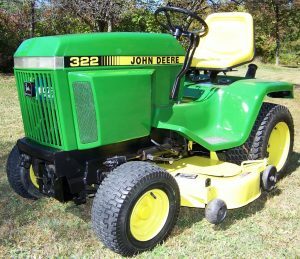 What Makes the John Deere 322 Different from the 318? 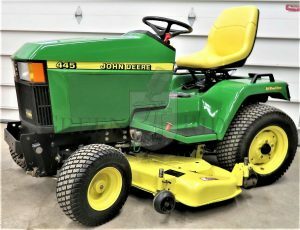 The John Deere 322 lawn tractor had a liquid-cooled, 18HP 3-cylinder Yanmar gas engine, whereas the 318 John Deere tractors used an air-cooled Onan gas engine. 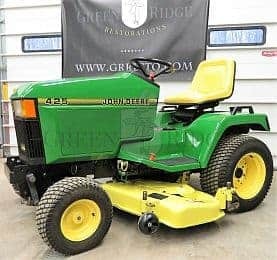 The 322 lawn tractors also weren’t produced for quite as long as the 318’s: John Deere only manufactured them from about 1988-1992. 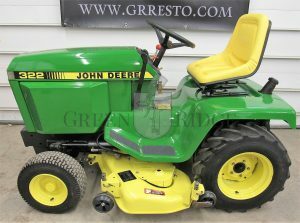 Looking for parts for your John Deere 322? 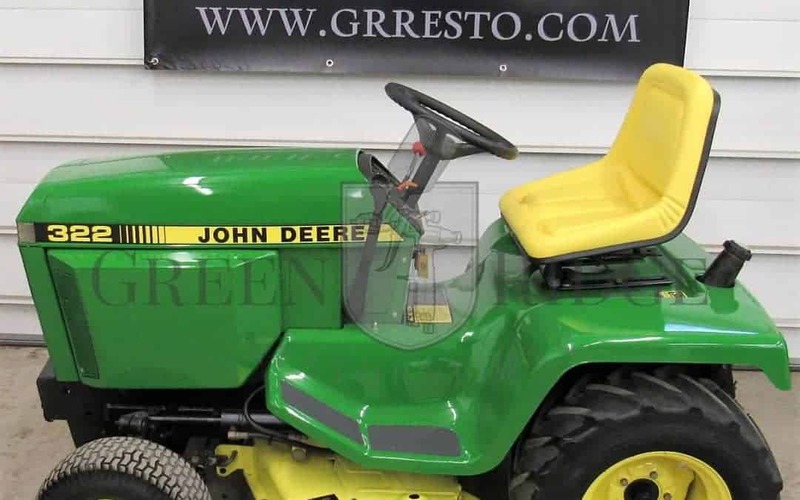 Your John Deere dealer is your best bet. 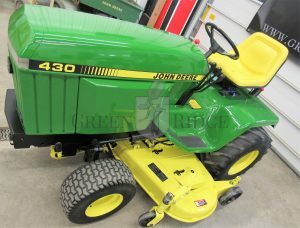 We recommend using JDParts to look up the parts you need. 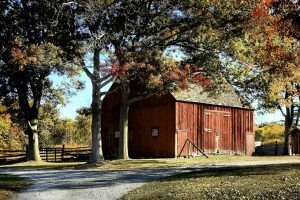 Ready to go back…way, way back? 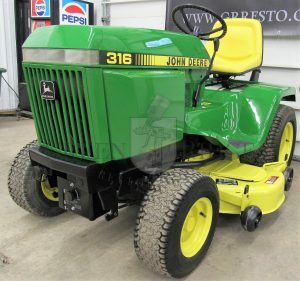 Let’s step back into 1988 when the first John Deere 322 rolled off the assembly line in Horicon, WI. Remember the California Raisins? Their version of the catchy song “I Heard It Through the Grapevine” hit #84 on the Billboard Hot 100. And if you’re a fan of Broadway you may know that back in January 1988, The Phantom of the Opera opened. Believe it or not, 1988 was a big year in the early history of the Internet. The 1988 Internet worm became the first well-known computer virus. The World Wide Web (WWW) was discussed at the European Organization for Nuclear Research (known as CERN). And, the first permanent intercontinental Internet link was made between the US and Europe.